Беспорядки в Иране — ПРЯМАЯ ТРАНСЛЯЦИЯ. Смотрите и комментируйте с «Русской Весной» - Rusvesna, December 31, 2017 (links 46 minute video). “In the events of last night, unfortunately a total of about 10 people were killed in several cities,” state TV said in a package aired on Monday, without elaborating, as cited Reuters. Iran unrest: 'Ten dead' in further protests overnight - BBC, January 1, 2017 (links two videos; more brief videos on BBC twitter, e.g. 1, 2, with significance unclear). 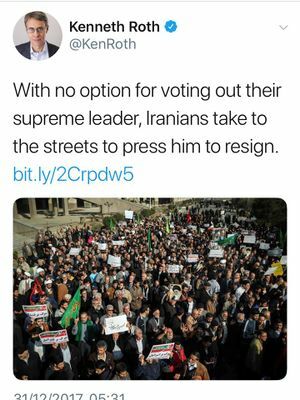 The Saudi-owned pan-Arab daily Asharq Al-Awsat quoted Iran's most famous human rights lawyer as saying Iranians should stay on the street and that the constitution gave them the right to hold demonstrations. Authorities have responded to the nationwide anger by staging pro-government rallies in several cities. 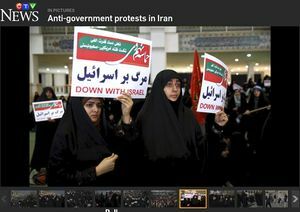 On Thursday, state television showed thousands of marchers in Mashhad carrying posters of Khamenei and banners that read "Death to seditionists". 'An armed terrorist cell, which was assigned to explode and kill innocent people in order to keep the recent unrest going, had infiltrated Iran,' the Ministry said in a statement. The terrorists in a clash with Iranian security forces in the northwestern city of Piranshahr in west Azarbaijan, killed three forces, according to the statement. One terrorist was also killed, and some other members of the cell were injured in the clash, said the Ministry. During the operation, some weapons, including Kalashnikovs, grenades, military uniforms, and instructions to provoke unrest was confiscated, according to the statement. Three other terrorist cells had previously been identified and dismantled in western Iran, the statement said. The Central Intelligence Agency has established an organization focused exclusively on gathering and analyzing intelligence about Iran, reflecting the Trump administration’s decision to make that country a higher priority target for American spies, according to U.S. officials. The Iran Mission Center will bring together analysts, operations personnel and specialists from across the CIA to bring to bear the range of the agency’s capabilities, including covert action. He said that the main mastermind of the plan was an American national named Michael Andrea who was a former CIA member in charge of combatting terrorism that formed the group to create unrest in the Islamic Republic of Iran. "Michael Andrea along with an officer affiliated to Mossad spy agency where in charge of masterminding the plot while Saudi Arabia paid for all the expenses," he said. Montazeri said that the plot dubbed as 'Consequential Convergence Doctrine' was designed based on the data gathered throughout years, adding that they conducted various scenarios such as protesting the high cost of living, high pay of bills and financial demands of the retired people. They had offered two models named Tunisia and Libya and finally chose the latter which was to create waves of unrest from outside to the center, he added. They had prepared two operation rooms in Ebril of Iraq and Herat in Afghanistan to create riots in Iran, he said. This page was last edited on 16 January 2018, at 15:23.